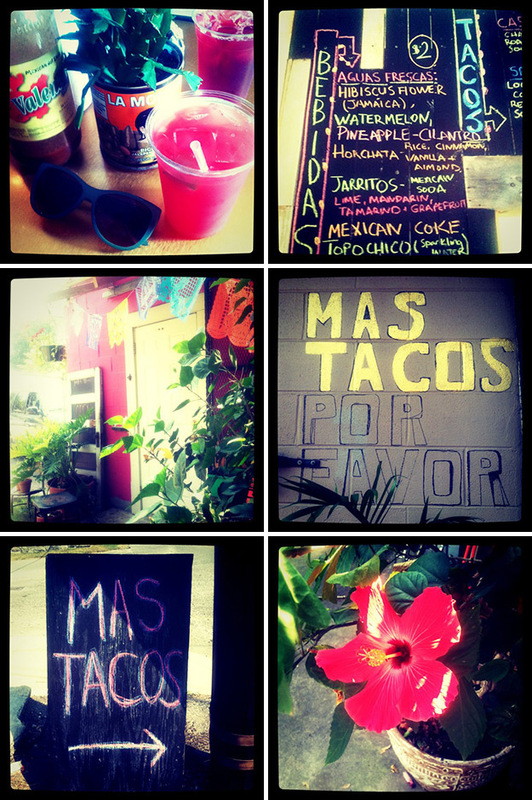 A few weeks ago I had the great good fortune of dining at Mas Tacos for the first time. All I have to say is: Yes, please! Since then, I have been back three times and I fully intend to go once a week for the rest of my life. I'm not a huge fan of Mexican food but I love everything that Mas Tacos has fed me. My favorite so far: a fried avocado taco, creamy and warm and topped with crunchy, tangy red cabbage slaw. To go with it, a refreshing watermelon agua fresca. On my second visit my lovely friend Katie (who is now in Spain) ordered a horchata, a drink flavored with rice, almonds, vanilla and cinnamon. I immediately ran home and tried to make horchata ice cream. I'm not going to lie to you, it was a miserable failure! Who was I kidding? I, having never made horchata before, am obviously not going to be able to top Mas Tacos. My lazy yet wonderful solution? 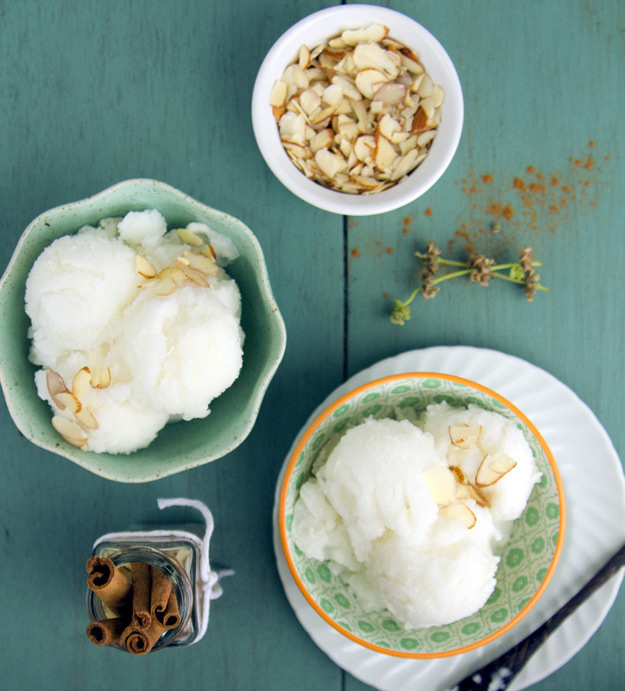 Horchata sorbet. I bought horchata from Mas Tacos and popped it into my ice cream machine. Delicious. No ice cream maker? No problem. 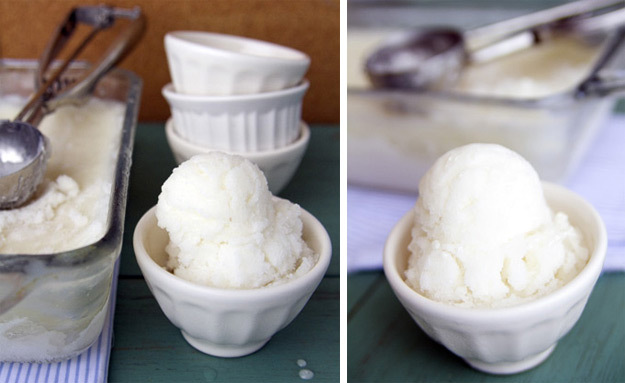 Make granita! Put your horchata in a shallow baking dish in the freezer and scrape with a fork every 40 minutes or so until it looks like an italian ice. I used 4.5 cups of horchata (makes about a quart of sorbet). That means you need to buy three glasses at Mas Tacos (you WILL have some left over to drink). It's important that you ask for "no ice." 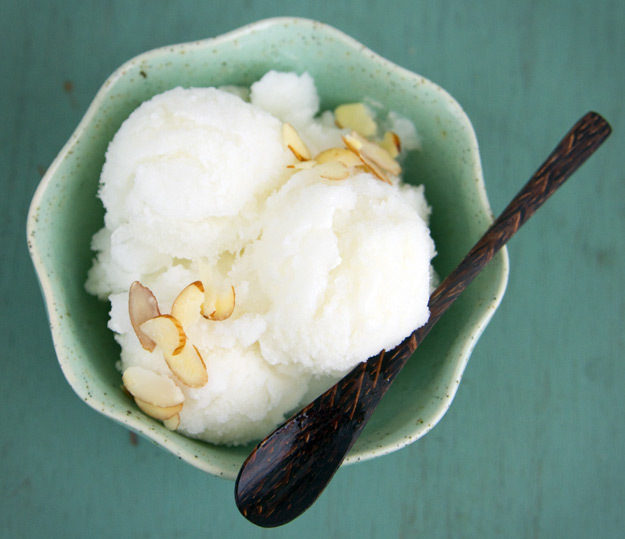 If you want your sorbet to have more of an ice cream consistency, use 4 cups horchata and 1/2 cup heavy cream. Freeze overnight before serving. Recommended toppings: slivered almond and cajeta. i love that spoon, begonia! Wow! I LOVE horchata! I also love the colors in the top photo...beautiful!!!!!! awesome! I know, isn't Mas Tacos insanely good? I live a mile from there and go once a week. The fried avocado is the best. Have you tried the chicken tortilla soup? It's my second favorite thing on the menu. Um, I adore ALL of these photos. My friend who lives in Nash. loves Mas Tacos. Mmm...I kind of want to try it when I come up! :-) And I've never tried horchata before. Sounds yummy! Thank you all! I have not tried the chicken tortilla soup but I definitely will next time I go. Caroline- how long are you going to be in Nashville? There is SO much to do!